What would you do if you were filled with music and wanted to sing out loud - especially in worship - but such expression was frowned upon? 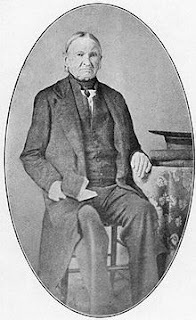 In early 1800 Upper Canada, David Willson (1780-1866), a former American of Irish Presbyterian descent, joined the Yonge Street Society of Friends but soon realized that he couldn't contain his passion for music as a form of worship. His music not only went against his membership in the austere Society of Friends, it was also looked down upon by the Presbyterian, Baptist, and Methodist clergy of the time. My post on Aug 5th, 2015 explained the history of David Willson, the Children of Peace, and the Sharon Temple, and today I'm going to share with you the effect of their music on early 19th century Upper Canada. 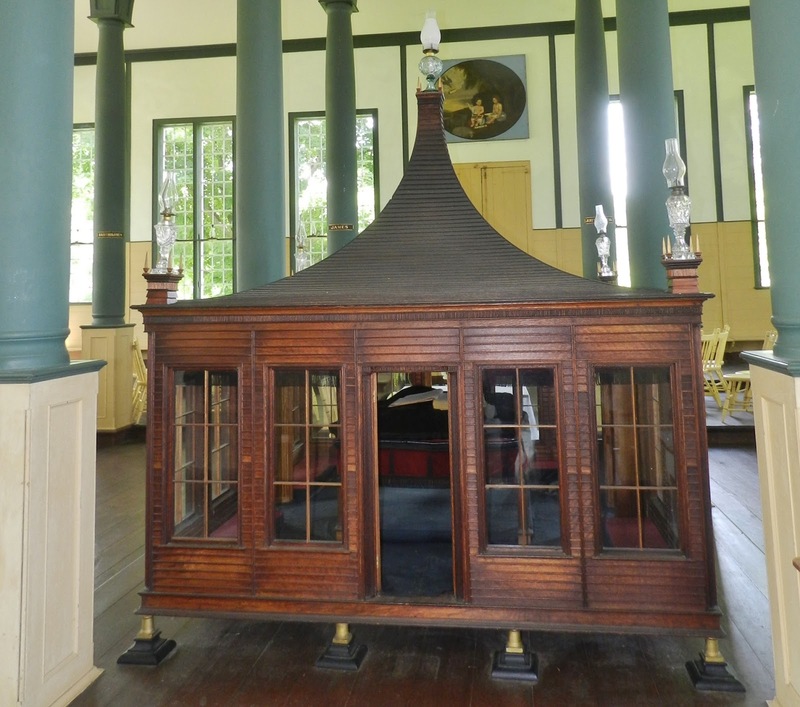 Until their first log Meeting house was constructed in 1819, the Children of Peace met in David Willson's own house where he would sing his ministry. 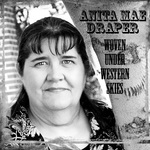 Believing that singing was a spontaneous expression of God's word, he never sang the same sermon/message twice. His thousands of hymns were recorded in the "Book of Sacred Record" and hidden in a secret compartment of the Ark, where they were finally found in 1990. In the Meetings, Willson read out a line of the hymn, waited for it to be repeated by the choir, and then it was repeated back by the congregation. Called "lining out", this form of singing was popular from the 16th to the 19th century where literacy rates were low and printed books were expensive. As an expression of worship, this a cappella singing was slow and allowed for personal improvisation which fit in well with the Children of Peace. In 1819, singing classes began for interested members and a year later, one of them by the name of Patrick Hughes, formed a band. In 1820, the Children of Peace commissioned Richard Coates, a painter-musician from York (Toronto) to build the first of three musical instruments for the new community of Hope. The first of this kind built in Ontario, it is a 2-barrel organ with 133 pipes and two barrels with ten sacred tunes each. Today, this is the oldest organ of its kind in Canada. Richard Coates went on to build two more organs for the temple, and along the way painted the two banners which hang in the temple. When Patrick Hughes stepped down, Richard Coates stepped forward to succeed him. 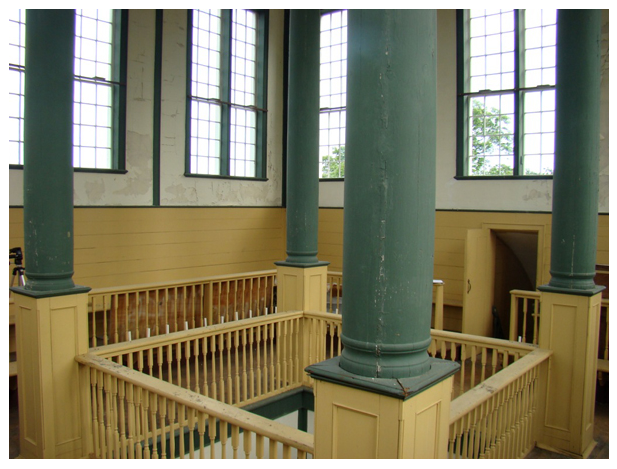 In William Lyon Mackenzie's book, Sketches of Canada and the United States, London 1833, he wrote that the Sharon Temple's musicians gallery was "...at least thirty feet above the congregation. And when the large full-toned and soft-set organ, built by Mr. Coates, of York, shall be set up in this room, together with the players on the flutes, violins, bass-viols, bassoons, clarionets, and flageolets, used by the society in their worship, the effect will remind a visiter of 'the music of the spheres,' about which bards of old have sung..."
According to Isaac Fidler's Observations on Professions, Literature, Manners and Emigration, in the United States and Canada, Made during a Residence there in 1832, New York 1833, young women dressed in white and known as the 'chorus of virgins', would "...assemble previous to entering the temple, and march thither for public worship, two abreast, with as much regularity as a file of soldiers". Other accounts reported that the singers would climb the steep 'Jacob's ladder' to the musicians' gallery, where their voices would float down to the congregation amid the hymns and worship of the organ and other instruments. The Sharon Temple Museum contains several buildings. 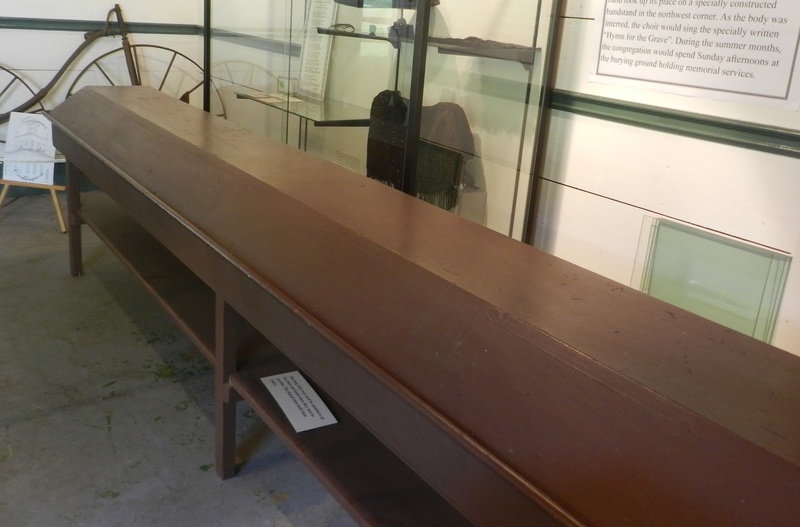 I found the following two artifacts very interesting,particularly this angle-topped table where members of the choir and band would place their music during practice. Sharon Temple Band Music Table which held the music sheets while practicing. Enthusiastic young people rode for miles to attend practice sessions and rehearsals and by 1846, another singing teacher, Daniel Cory of Boston, was hired for two years of instruction. The band was in high demand, helped by accolades such as the aforementioned William Lyon Mackenzie saying, "The band of the township of East Gwillimbury is one of the most splendid and complete we have ever listened to..."
In 1848, Richard Coates built the last of his Sharon Temple organs, but unlike the first two barrel organs, this one was a keyboard organ with manual bellows on the side (hidden behind a piano when I visited the Sharon Temple, perhaps to stop curious tourists from trying it out). Impressive at fourteen feet, the keyboard organ has three semi-circular towers of gilded pipes. However, the pipes are merely decoration while the 200 wooden flue pipes hide inside. Have you ever heard the sound of an authentic pump organ? My research uncovered that very thing on Jamie Thompson's blogpost, Gem Within a Gem. 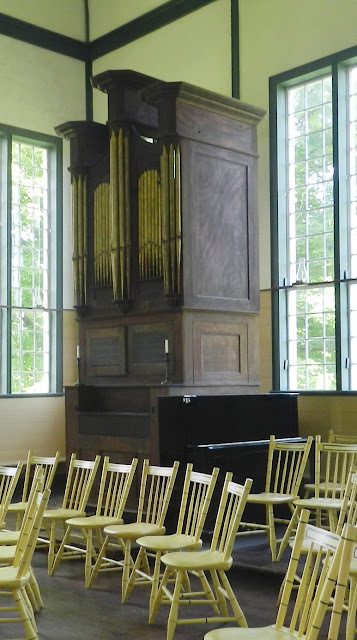 Jamie is a flutist and was at the Sharon Temple when he noticed two staffers, one of which was the organist, and he asked them to accompany him. So what you hear is Jamie playing the flute, one staffer playing the organ, and the other staffer pumping the organ. What a treasure! Check his blogpost for an image of this event. 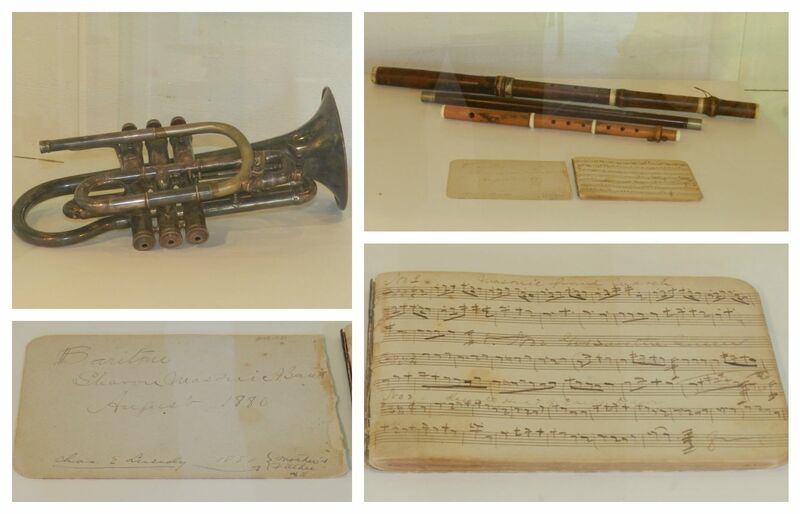 In the 1860's, the Children of Peace bought a silver set of instruments from Boston, worth $1500, and from then on was known as The Sharon Silver Band. Also known as the Temperance Band in the local Newmarket Era, the band played most secular music as it performed at many venues around York County and in Toronto. According to Ethel Warren Trewhella's History of the Town of Newmarket, "...the magnificent silver band organized in 1820, and which in 1876, at Philadelphia Centennial Exhibition, won the first prize as the best amateur band in North America." That's quite the honor. David Willson's death in 1866 had hit his followers hard. With his son lacking the charisma to be an effective leader, and enthusiasm waning among his followers, the once thriving membership was dissolving. The choir sang their final song at the September 1883 Feast of Harvest. According to the Canadian Encyclopedia, "In August 1886 the Children of Peace held their last meeting, ending one of the most colourful chapters in Canada's early music history. The music in Sharon proves that musical excellence can be found outside wealthy and sophisticated urban centres, given inspired leadership and a prominent place in the social fabric." Now that the Sharon Temple has been restored as a National Historic Site & Museum, the Sharon Temple Society is hosting many events throughout the year as a means of keeping it open so that the history of this fascinating part of Upper Canada life is not forgotten, including the upcoming Festival of Stories, and the much-anticipated annual Illumination Service. This post shows how music was perceived in the first half of 19th century Ontario, Canada. Care to share how music started in your area? Those are fascinating pictures. I sing in the choir at our church and we have an orchestra, but I've never seen anything like this before. It's actually rather beautiful in the color combinations and the architecture. Thanks for sharing.